These days a lot of my old portfolio has been pushed out by stuff from the last couple of years, especially as I've started a more remote work style. It's not unexpected - you refine your technique, develop a more specific editorial taste, and have some styles and phases and backyards that you just move on from. 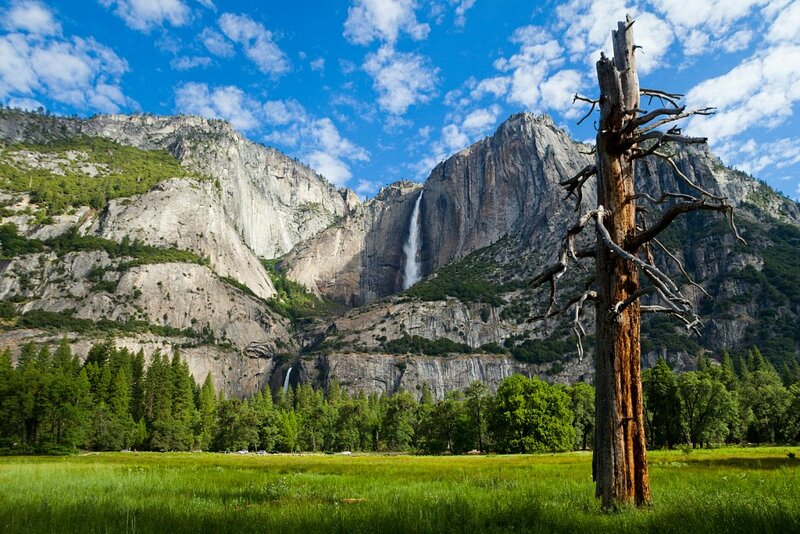 Yosemite FallsThe iconic tree that stood in front of the Yosemite Falls view from Cook's Meadow for many years. Sadly, it's since toppled over in the winter of 2013. This is the earliest shot that I've kept around - Yosemite Falls in early summer. Simple, and straightforward - the viewpoint just from a common boardwalk that hundreds of visitors pass by on any popular day in the park. I lucked out with one of those perfect days, at the perfect time of year - just enough partly-cloudy fragments to diffuse the light, just enough sun to dynamically spotlight the scene, and just enough rain from a rare wet winter to flush the meadows with green. For a very long time, it was the favorite photo I'd taken. I was just getting my feet wet into landscape photography, and it was one of the first I was really happy with, that I felt could have its place next to the amazing and polished stuff in the Flickr feed or DPReview forums. But as the years went by, the park was forever getting more crowded, Instagram and Reddit just highlighted the exact same spots over and over again, and it felt increasingly difficult to visit old places and still find a unique and untrodden journey, still wild enough to call your own. Call it fomo or wanderlust or a search for belonging - I'm sure many of us have scrolled the feeds on social media and felt something like it. It's actually been more half a decade since I've set foot in Yosemite Valley itself. I did get a little jaded and uninspired. Posting this, I'm not sure how well it stacks up to other scenes I want to show - certainly I've traveled to far more exotic destinations, lived so many more breathtakingly foreign moments, and braved much worse than a California June to get there. Pretty as it is, it's hard to imagine a standard Yosemite postcard vantage point can convey that story and capture imaginations the same way. And yet, the first favorite photo will keep that nostalgic place for you - it's not the most obscure, the most laborious, the most "epic"... but it's from a time when even the ordinary was a complete greenfield. A time when you didn't need to even think about the best next direction - every step you chose would forge out fresh footprints. A time when experiences were just experiences and not a bucket list item. We'll all have different paths, some of us will stray far from that time, and some will be quite content to never leave it. I expect the trails will intertwine and bring me back to capture the Valley again someday. It might be a better photo. It might be a new favorite. But it'll be a different photo, even if every cloud and blade of grass aligns itself in the same position. The first photo has and will always live in its own moment, free from analysis or comparison or anything that came after. That's all it really needs to be. I'm Nathan, an engineer and traveling photographer! You can follow along on my Instagram to see what I've been up to lately!